Dog fans love all the things about their furry friends. Well, almost all things. Most aren’t big fans of the smell. Do you wish you could rid your lawn of pet odors? Pair one of our best pet turfs with ZeoFill organic infill. Your dog will get a clean, dry place to play. You’ll get a lawn that stays fresh, is easy to care for, and is quick to clean. 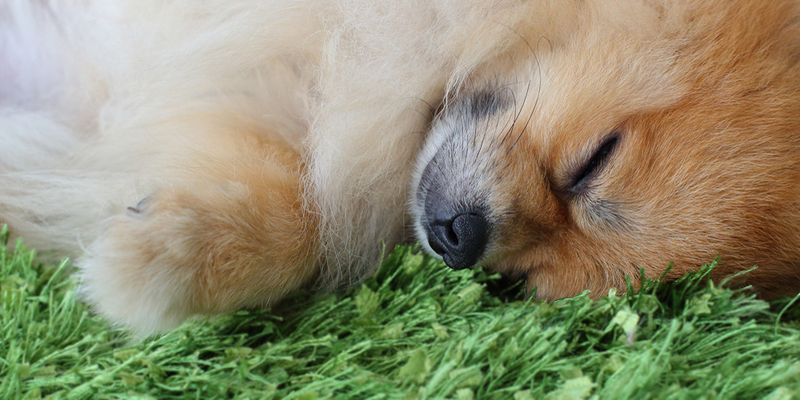 ZeoFill is a non-toxic turf cushion that stops pet odors. In your home yard or in a pet spot or dog run, this eco-smart product stops the main odor agent in pet urine. Watersavers Turf is glad to carry ZeoFill and a range of top pet grass styles. With our help, you can build a great dog zone that has a soft, green lawn look and great odor control. There are many uses for ZeoFill. It’s great for kennels, big home yards, or small pet areas. This infill is built to stand up to daily use by groups of pets. That’s why both dog owners and kennel owners find plenty of uses for ZeoFill. This brand is also certified organic. So, it’s made in a way that is good for the Earth and all who live here. With a 98% purity rate, it comes from the purest mine in the world! Choosing to add an eco-smart infill helps you do your part to build a bright future. When you look into uses for ZeoFill, remember that you’re choosing a product that’s good for the planet. Zeolite organic infill doesn’t just protect the planet. It comes straight from it. Zeolite is a mineral that is 100% natural and sourced from the earth. When volcanic rock and ash meet water in the ground, it forms. Some products out there use zeolite that contains impurities such as lead and volcanic glass. Some even have traces of Quartz. This could cause cancer or poor birth defects. On the other hand, our Zeolite organic infill is the purest form you can find. Lucky for us, it turns out there are a lot of ways to use this mineral in our daily life. Zeolites are used to purify water, and to separate natural gas in the air. They even help grab nitrogen from the air on plane flights. This allows passengers in planes to enjoy a high amount of oxygen in each breath they take. For your purposes, Zeolite organic infill offers a safe lawn that reduces dog odors. Zeolite stops pet odors through natural processes. The product simply interrupts the breakdown cycle of dog urine before it can start to smell. Zeolite stops pet odors by keeping the ammonium in pet urine from turning into gas. That gas is what gives off the stale smell. Quite simply, Zeolite stops pet odors before they start by moving elements apart before the cause odors. That’s why this mineral is used in no-clump cat litter blends. It’s also why a turf infill made with it is so ideal for pet grass use. This brand is certified organic. ‘Certified Organic’ means experts have confirmed that it was made in a planet-friendly way. It’s even on the “YES” list at OMRI. They’re a top watchdog group that rates and ranks items to let folks know if they are made to tough organic standards. ZeoFill helps you save water, too. In fact, so do all turf products. You don’t need to water them to keep your grass green, so you save a key resource. That said, that’s not the only concern you may have when installing it. Folks who care about pets know that it matters to give them a safe and healthy place to live and play. We know that too. That’s why all 60+ of our grass types are lead-free, and why we offer this certified organic fill to pair with our pet turf grass. How is the Organic Infill Cleaned? While a turf that reduces pet odors may be useful, you might also have a question: How is the organic infill cleaned? A surface that blocks pet urine smells is great. An organic infill cleaned of all pet urine is even better. Organic infill cleaned via nature is best. That’s what you get with this product. The molecular structure of ZeoFill is honey-combed and negatively charged to absorb urine like a sponge. This prevents the ammonia from releasing a gas and producing the unwanted smell. Gasses are held within the ZeoFill infill until rainwater, containing sodium ion (Na +), changes the magnetism of the granules and flush the bacteria through the turf into the ground. This process cleanses the infill making the turf practically new again. Because you want the granules to absorb the urine, rather than water from your hose, there is no need to water your turf down often. Occasionally hosing down to clean the turf is just fine. This infill will not clump, clog or cause jams in the drain hole of your synthetic grass. The product is 100% permeable. This means the turf holes stay open allowing for full drainage and keeping the grass on top dry. Because there is no continuous moisture, no mold will grow and the ZeoFill dries in a few days. Once you install your turf with ZeoFill, you won’t have to change it out. It’s an one-time choice that sets up your dog space to stay clean and fresh for the whole life of your yard. Therefore, very minimal maintenance is needed for your infill to keep your yard smelling nice. Contact Watersavers for all your turf infill needs. We sell a full range of pet grass and all the best tools to install and care for turf. Get a free quote on cost, come to one of our CA stores, or call us at 844-974-8873.